Phonon is a quantized sound wave – a collective vibrational mode of a solid (or liquid). It is the quantum of acoustic or vibrational energy. Phonons, like all quanta in quantum mechanics, have wavelike and particlelike properties. Phonons play a major role in many of the physical properties of condensed matter, like thermal conductivity and electrical conductivity. The study of phonons is an important part of condensed matter physics. Phonon is considered a quasi-particle, beacuse it can exist only in solids as a consequence of vibrational motions, they cannot propagate in vacuum. 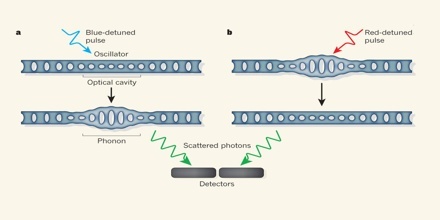 Phonons are specific sub-state of photons where levels of energy are well defined and they can play an important role in certain phenomena, hence the name phonons. Phonons are a way to describe the vibrational degrees of freedom in periodic structures (lattices): the vibrational motions can be modelled as harmonic oscillators, so they can be quantized nearly in the same way. The concept of phonons was introduced in 1932 by Soviet physicist Igor Tamm. 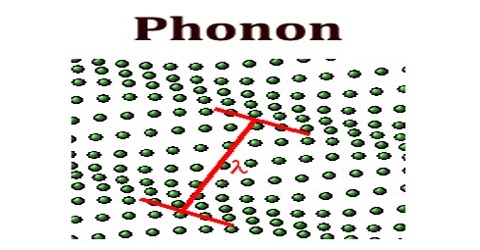 The name phonon comes from the Greek word φωνή (phonē), which translates to sound or voice because long-wavelength phonons give rise to sound. Shorter-wavelength higher-frequency phonons are responsible for the majority of the thermal capacity of solids. Phonons and electrons are the two main types of elementary particles or excitations in solids. Whereas electrons are responsible for the electrical properties of materials, phonons determine such things as the speed of sound within a material and how much heat it takes to change its temperature. 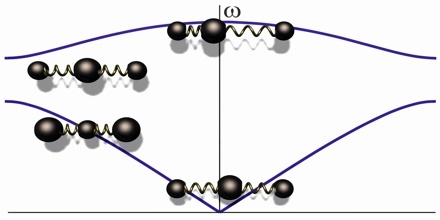 Phonons are collective excitations of the lattice displacement field. There are two key distinctions between phonons and fundamental particles like electrons. 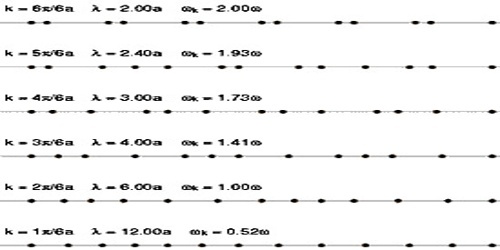 Firstly, phonons are an effective description that only makes sense above a certain length scale, the lattice spacing. The other distinction is that phonons are gapless (massless), which means you can create one with an arbitrarily small amount of energy. New electrons can only be created by processes involving energies larger than the electron rest mass. These energies are inaccessible at the low temperatures dealt with by condensed matter physicists. However, such energies are accessible in high energy physics, where one must replace the description of electrons by wave functions to a description in terms of quantum fields. Then electrons are viewed as collective excitations of the Dirac field, which exists at every point in space-time. Phonons are especially useful in mathematical models for calculating thermal and vibrational properties of solids. A phonon is a quantum of energy of the independent oscillators in the ensemble.